Terrence Riddle and Jay Wimbrow gather in the new Wireless Zone store in the new shopping center in Ocean View. The Wireless Zone store at 83 Atlantic Avenue in Ocean View (the new shopping center on the former Archut property) is the sixth store in a franchise owned by Tajesh Patel. The other locations are in Dover (two stores), Milford, Harrington and Hockessin, according to Terrence Riddle, sales director. 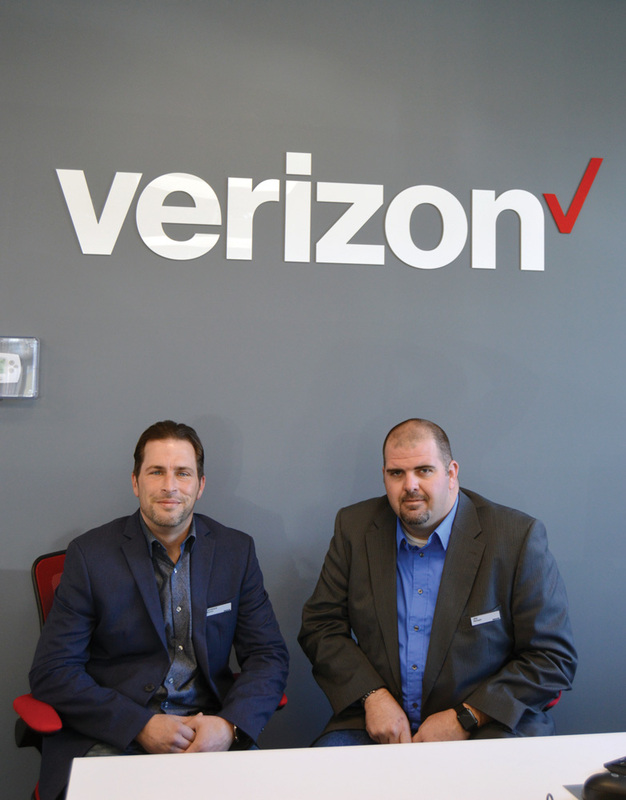 With its first foray into southern Sussex County, Riddle said, the group felt the area was ripe for a one-stop store to meet the needs of Verizon customers, whether they’re long-time residents or vacationers. “In this market, I think it’s really needed,” Riddle said, adding that the group has a philosophy of opening new stores “where it makes sense” and that they don’t want to “overstack” where there are other Verizon dealers. In the past several years, Riddle said, Verizon has changed the way it handles its retail operations, and 95 percent are now through authorized agents or franchises, as opposed to Verizon-owned stores. Verizon, Riddle said, does “corporate-regulate” each store, as far as pricing of phones and plans, so prices will be the same no matter what store a customer enters. In addition to himself, Wimbrow said, the store has three employees, all of whom have completed training courses on Verizon products and services. Riddle said the store is focused on customer service, not just selling phones. “We are more about the customer experience,” he said. “We’ll never have the sales if we don’t capitalize on taking care of the customer’s needs and priorities first and foremost,” he said. “They don’t just want to buy a phone and then go online and figure out how to use it. We’re here to show them,” he said. Even though the store technically sells and services Verizon products, Riddle said, if someone comes in who uses another carrier, but “they’re stranded,” with a phone issue, “we’ll help them out. We’re not just here to make a buck,” he said. Wimbrow said one of the key services he foresees, with all the housing growth around Ocean View and Millville, is homeowners who are part-time residents and might only use their homes for vacations, but who want to have wi-fi service at their house. “We can help them out with that,” Wimbrow said. In addition, the team at the Ocean View store is well-versed in programs available to consumers that aren’t generally advertised, such as discounts for first-responders and members of the military. “A lot of times,” Riddle said, teachers and other public-sector employees “don’t know that they have a discount available, yet they’ve had their Verizon plan for five or six years. It’s nice for us to be able to bring that to their attention,” Riddle said. There is also a discount plan for consumers who are 55 or older, he said. Another well-kept secret, he said, is that Verizon Wireless offers a service for land lines, called Home Phone Connect, that costs $20 per month for unlimited nationwide calls. Staff training is internet-based, but is backed up with in-store training, Riddle said. Wimbrow said he tracks where his staff members are in their training, and that whenever there is “down-time” in the store, they encouraged to move forward in their training. While the store’s exterior sign is not up yet, Riddle said that should be completed in the coming weeks. The store officially opened Thursday, March 14, but a grand-opening celebration and ribbon-cutting are scheduled for April 5. Both Riddle and Wimbow emphasized that the store’s staff hopes it will be an integral part of the community, and that special celebrations such as “Schools Rock,” which will include a book-bag giveaway and fun activities for families, will be scheduled in the coming months. The Schools Rock day will be July 21. Wimbrow said he has established a relationship with the Alana Rose Foundation and expects that to continue as well. The Ocean View Wireless Zone is located at 83 Atlantic Avenue. For more information, call the store at (302) 308-5800. Store hours are Mondays through Saturdays, 10 a.m. to 8 p.m., and Sundays from 11 a.m. to 5 p.m.